Rice is the most widely consumed staple food mainly in Asia and the third largest agricultural production after sugarcane and maize. However, plantation of rice is the most labor-intensive process in rice farming. Rice Transplanter is innovative agriculture machinery which reduces the labor and increases the efficiency of rice transplantation. Requirement for agricultural machinery in Asia-Pacific region is doubled than in any other region. As per Food and Agriculture Organization (FAO) of United Nations, rice production is expected to increase by 1.3% and projected to reach volume over 500 billion tons in next two years. Increasing demand for rice production is anticipated to propel market for rice transplanter in the near future. Moreover, government’s initiatives to use agriculture equipment are also likely to boost the growth of rice transplanter market. For instance, governments of Europe and America are trying to educate the farmers about the benefits of agricultural equipment for improving farm production. Rashtriya Krishi Vikas Yojana by Indian government initiated to help the farmers to purchase agricultural machineries tractors at minimum interest rates. The global rice transplanter market is estimated to reach USD 13.06 billion in 2024 from USD 8.07 billion in 2016, growing at a CAGR of 6.20% during the forecast period. Nearly 90% rice production by volume comes from Asia thus creating a huge demand for rice transplanter in this region. Asia-Pacific is the dominating region for global rice transplanter market in 2016 and is expected to dominate the market over the forecast period. Asia-Pacific rice transplanter market is projected to grow at a CAGR of 7.0% during the forecast period. China, India, Indonesia and Thailand are fuelling the demand for rice planters in the region. China occupied 25% market share of Asia-Pacific rice transplanter market in 2016. Strong sales of rice planting machine have been observed from Latin America region in past few years. Huge diversity of natural resources and continuous pressure to improve efficiency and productivity of farm sectors is contributing in the demand for machineries for agriculture sector. Countries such as Brazil and Argentina are mechanizing their agricultural sectors with advance farm equipments. This supports the increasing sales of rice transplanter in Latin America region. Latin America rice transplanter market valued USD 1.16 billion in 2016 and is projected to reach USD 2.09 billion in 2024. Europe and America together held 27% share of global rice transplanter market in 2016, owing to the rising adoption of rice planters in the region. Increasing trend of adopting precise farming to increase yield production with optimize utilization of resources is turning the adoption of farmers towards advance agricultural machineries. This is eventually boosting the demand for rice transplanter across the globe. Although agricultural equipments help in farming and improve production however, high cost of advance equipments is restricting the adoption among farmers. Farmers are facing financial concerns while replacing conventional or old machines with advanced agriculture equipments is limiting the growth of the global agriculture equipment market. 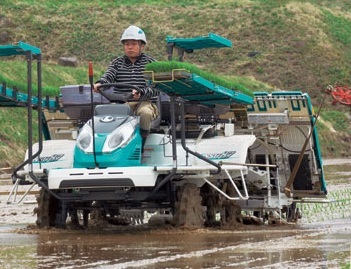 This is eventually restraining the growth of rice transplanter market. Nantong FLW Agricultural Equipment Co. Ltd.